Moving to a new home or apartment can be a stressful time in anyone’s life. You never realize how much you’ve got you have until you have to move. Moving is a job, but it doesn’t have to be when you hire a professional moving company. Many people think that hiring a professional moving company is quite expensive, but that isn’t true. There are many advantages of hiring a professional mover. One advantage of hiring a professional mover is the cost. The cost that you pay a moving company is less than doing it yourself. You will not have to take off work. You will save money renting a truck, dolly, moving boxes, blankets and packing material. A professional mover will come in and bring all the supplies needed to move you. They will pack your items safely and securely. They will move your furniture out of your current place and place it in your new place. You don’t have to worry about hiring or getting friends to help you move. You also won’t be injured in moving anything. All this will be done with a professional moving company. 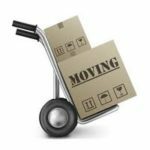 The cost of hiring a professional moving company is very reasonable when you consider these other costs you occur when moving. Another advantage of hiring a professional moving company is two heads are better than one. You probably don’t remember when you purchased your refrigerator and had it brought to your home. They may have had to take the doors off to get it through the door or if your washer and dryer is in the basement around tight stairs. With the professional movers, they deal with these tight situations daily and know how to get those big appliances and furniture out the door without damaging your items. Packing all those breakable items can be time consuming and tedious. This can take an average person days to pack everything. A professional moving team is trained and qualified in packing and can have your items packed in no time at all. The team will label all boxes so you know what is in the boxes. The cost of renting a rental truck is expensive. Most rental companies require you to put down a hefty deposit. The cost of the deposit and rental of a moving truck is expensive. You can’t forget the fuel that you have to put in these types of trucks can also be costly. With many advantages of hiring a professional moving company you should give the leader of movers. In the Nashville, TN. area, the top rated moving company in Nashville is Master Movers. Master Movers is #1 in Customer Satisfaction for 10 years in a row in Nashville, TN. At Master Movers you get a full service moving company with all trained and experience movers. The moving specialist at Master Movers will take care of all that packing for you. Relax and let the experts handle your moving. For local movers in Nashville, give Master Movers a call. Have you done a move by yourself and have had some bad experiences? Share them with us!